Tricia Wales writes, “Jill Dudbridge and my father were cousins. 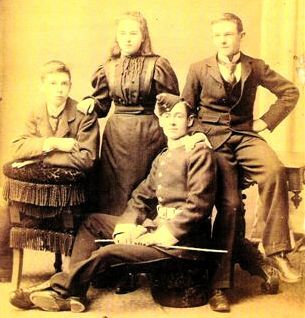 Both her father, Sidney Blencowe, his brother, Billy and half brother, Harry Blencowe were in the Wiltshire Yeomanry and fought in the Boer War. I looked for the Wiltshire Yeomanry on Google and found the South African Military History Society Journal in which I found an account of the part played by the Wiltshire Yeomanry in the Boer War. I trawled through the accounts of the various battles and stumbled upon a Corporal Blencowe saving the day and demonstrating the family trait of using your gumption to get out of tight situations!!!! Following Tricia's advice I found the journal and it is a lengthy blow-by-blow account of what happened written in an easy to read manner with the names of soldiers liberally sprinkled throughout. I have decided to include random paragraphs as an example of how war was the recorded. “Surely England owes a debt of gratitude to her gallant sons in the Yeomanry who, for the most part, accustomed to a life of easy plenty, cheerfully underwent not only the dangers of war but what is infinitely more trying, the hardships and exposure inevitable to this campaign animated only by a sense of patriotic duty”. Sidney, and Harry Blencowe survived the Boer War; Sidney went off to Argentina to build the railways, Harry migrated to Australia while Billy, William Edward Walley Blencowe, remained in the army as a regular and was killed at Ypres in 1914. He left a wife and four children.